US Defence Secretary Leon Panetta has played down reports that Israel is moving closer to taking military action over Iran's nuclear programme. "I don't believe they've made a decision as to whether or not they will go in and attack," he told reporters. Israeli PM Benjamin Netanyahu said recently that time was running out - a view also echoed by Israel's ambassador to the US. But Mr Panetta said the US believed there was still room to talk to Iran. Tehran denies that its nuclear programme is aimed at producing nuclear weapons, insisting that it is for civilian energy purposes. "The additional sanctions have been put in place. They're beginning to have an additional impact on top of the other sanctions," Mr Panetta told reporters at the Pentagon in Washington. The US defence secretary, who recently had talks with Mr Netanyahu in Israel, took issue with televised remarks on Monday made by Israeli envoy Michael Oren in which he warned that the window of time before the need to resort to military action was "small and... getting smaller". 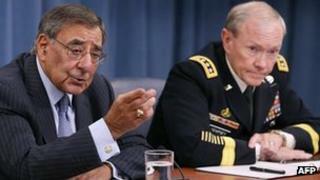 "From our point of view the window is still open," Mr Panetta said. BBC North America editor Mark Mardell says some believe that Israel's timetable is dictated not only by what is militarily possible but by the US presidential election in November. Although President Barack Obama has vowed that he will stop Iran acquiring nuclear weapons, the Israeli prime minister has said that Tehran believes the international community "does not have the will" to act. But while US officials argue they could inflict a heavy military blow on Iran's nuclear sites, the chairman of the US Joint Chiefs of Staff, Gen Martin Dempsey, has questioned Israel's own capacity to do the same. "My assessment hasn't changed. I think it's a fair characterisation to say they could delay but not destroy Iran's nuclear capabilities," he told the same briefing in Washington. Iranian Defence Minister Gen Ahmad Vahidi was quoted by media in Tehran as accusing Israel of "warmongering", describing its leaders as "brainless".